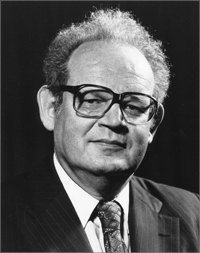 Benoit B. Mandelbrot was Sterling Professor Emeritus of Mathematical Sciences at Yale University (1999-2010). Other institutional affiliations included IBM and École Polytechnique. His research interests included applied mathematics and fractals. November 20, 1924Birth, Warsaw (Poland). 1947Obtained Diplôme d'Ingénieur, École Polytechnique, Paris (France). 1948Obtained MS in Aeronautics, California Institute of Technology, Pasadena (Calif.). 1949 – 1957Researcher, National Center for Scientific Research (CNRS) (Centre national de la recherche scientifique (France)), Paris (France). 1950 – 1953Engineer, Color Television Group, Philips Electronics. 1952Obtained PhD in Mathematics, University of Paris (Université de Paris), Paris (France). 1953 – 1954Member, Institute for Advanced Study. 1955 – 1957Instructor in Mathematics and Member of the Séminar Jean Piaget, University of Geneva (Université de Genève). 1957 – 1958Maître de Conférences de Mathématiques Appliquées, University of Lille (Université de Lille). 1957 – 1958Maître de Conférences d‘Analyse Mathématique, École Polytechnique. 1958 – 2010Researcher (1958-1974); Fellow (1974-1993); and Fellow Emeritus (1993-2010), Thomas J. Watson IBM Research Center, International Business Machines Incorporated (IBM), Yorktown Heights (N.Y.). 1962 – 1963Visiting Professor of Economics and Research Fellow in Psychology, Harvard University. 1963 – 1964Visiting Professor of Applied Mathematics and Staff Member of the Joint Committee on Biomedical Computer Science, Harvard University. 1966 – 1967Guest Professor of Mathematics, University of Paris (Université de Paris). 1969 – 1972Member, Committee on the Applications of Mathematics, National Academy of Sciences. 1969 – 1978Senior Staff Member, National Bureau of Economics Research. 1982Fellow, American Academy of Arts and Sciences. 1984 – 1986Visiting Professor of Mathematics, Harvard University. 1987Member, National Academy of Sciences. 1987 – 1999Abraham Robinson Adjunct Professor of Mathematical Sciences, Yale University. 1988 – 2010Fellow, Saybrook College. 1993Awarded Wolf Foundation Prize in Physics. 1993 – 1996Member, Commission on Mathematical Physics, International Union on Pure and Applied Physics. 1993 – 2010President, Mandelbrot Foundation for Fractals Inc.
1995Academy of Sciences Professor, École Polytechnique. 1999G. C. Steward Visiting Fellow at Gonville and Caius College, and Member, Newton Institute for Mathematical Sciences, Cambridge University. 1999 – 2010Sterling Professor of Mathematical Sciences (1999-2004) and Sterling Professor Emeritus of Mathematical Sciences (2005-2010), Yale University, New Haven (Conn.). 2005 – 2010Battelle Fellow, Pacific Northwest National Laboratory. October 14, 2010Death, Cambridge (Mass.). Advised by Mandelbrot at Columbia University. PhD advisor at Princeton University. Both employed at Thomas J. Watson IBM Research Center. Obtained Diplôme d'Ingénieur (1947). Maître de Conférences d‘Analyse Mathématique and Academy of Sciences Professor. Visiting Professor of Economics; Research Fellow in Psychology; and Staff Member of the Joint Committee on Biomedical Computer Science. Visiting Professor of Applied Mathematics. Researcher; International Business Machines (IBM) Fellow; and IBM Fellow Emeritus. Instructor in Mathematics and Member of the Séminar Jean Piaget. Maître de Conférences de Mathématiques Appliquées. Obtained PhD in Mathematics (1952). Guest Professor of Mathematics. Sterling Professor of Mathematical Sciences; Sterling Professor Emeritus of Mathematical Sciences; and Abraham Robinson Adjunct Professor of Mathematical Sciences. Obtained MS in Aeronautics (1948). Member, Commission on Mathematical Physics. Member and Member, Committee on the Applications of Mathematics. G. C. Steward Visiting Fellow at Gonville and Caius College, and Member, Newton Institute for Mathematical Sciences. Received 1993 Wolf Foundation Prize in Physics. Physics colloquium: celebration in honor of the 100th birthday of Laszlo Tisza [videorecording], 2007 May 10. Benoit Mandelbrot video autobiographical interview. Fractals : form, chance, and dimension / Benoit B. Mandelbrot. Multifractals and 1/f noise : wild self-affinity in physics (1963-1976) : selecta volume N / Benoit B. Mandelbrot ; with contributions by J.M. Berger ... [et al.]. The fractalist : memoir of a scientific maverick / Benoit B. Mandelbrot. Benoit Mandelbrot New York Times obituary. Benoit Mandelbrot Physics Today obituary. Fractals in physics : essays in honour of Benoit B. Mandelbrot : proceedings of the international conference honouring Benoit B. Mandelbrot on his 65th birthday, Vence, France, 1-4 October, 1989 / editors, Amnon Aharony, Jens Feder.